Until someone invents a time machine, the best way to visit the railway operations of yesteryear in Southern Ontario is through the pages of Ian Wilson’s books. 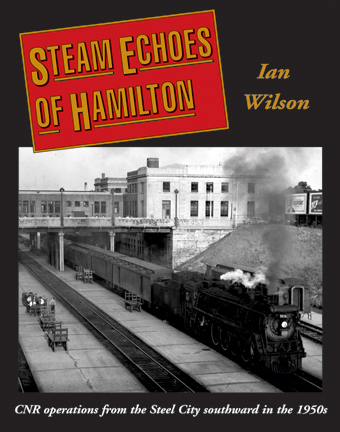 Through the pages of Steam Echoes of Hamilton, take a trip back to the railway activity surrounding the steel manufacturing centre of Canada. In addition to the variety of industrial switching and downtown operations, you will enjoy exploring the Hagersville Subdivision southward from Hamilton. Take a branchline train ride through Caledonia and Jarvis to the scenic north shore of Lake Erie. Watch the small engines and mixed trains amid the scenic surroundings of Simcoe, Port Rowan and Port Dover.